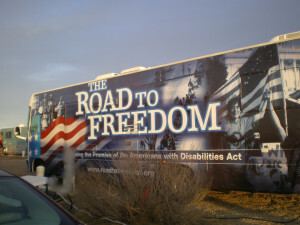 Help Tom Olin get The 2008 “Road to Freedom Bus” back on the road. The bus, a 35’ foot RV, is slated to join The ADA Legacy Project’s (TALP) national Legacy Tour to celebrate the 25th anniversary of the Americans with Disabilities Act (July 26, 2015). The tour begins in Houston in July of 2014. The bus is a central connection point on the Legacy tour, carrying the history of the ADA and other disability rights and justice issues. It will serve also as a backdrop at stops and events. The bus will be a platform for young emerging leaders communicating with older leaders, for allies and artists, organizations, and legislators. 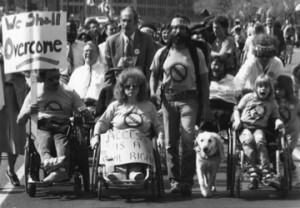 Read more at the Disability Rights Center’s website.